Since the start of Orange County recycling in 1990, over one million tons of materials have been processed and repurposed. To further encourage recycling and help mark the 24th year of residential curbside collection, Orange County Utilities is hosting Orange County Recycles Day on November 15, from 10 a.m. to 2 p.m. 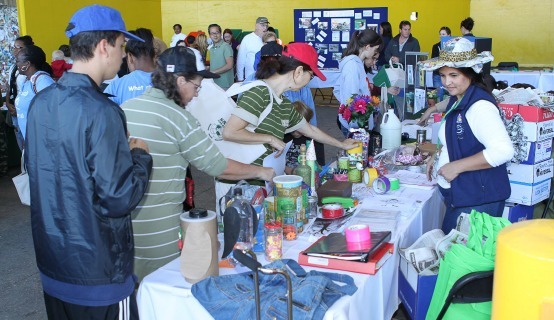 The annual event, held at the Orange County Landfill, will be filled with activities all targeted to stress the importance of recycling to county citizens. Based on attendance in previous years, several hundred Orange County residents are expected to attend this popular celebration. The family-friendly and free event promotes recycling countywide and offers residents a tour of the Orange County Landfill as well as truck displays and entertainment. Children will be able to engage in face painting, dancing, and various contests. Participants will have an opportunity to have confidential documents shredded (limit to 10 file boxes per vehicle). Attendees will get an up-close look at residential collection equipment such as garbage and recycling trucks, and landfill equipment including bulldozers and loaders. Eligible Orange County residents can pick up new recycling bins, as well as recycling and garbage service information. Goodwill and American Textile Recycling Services will also be at the event collecting donations. Last year, 2,500 pounds of goods were donated to Goodwill. Victoria Gonzalez, Director of Donor Services for Goodwill Industries of Central Florida, said she thinks this year’s event will bring even more goods from the community. Many Orange County employees work together helping make this annual event, which attracts approximately 600 – 800 attendees, a success. Orange County staff coordinate the event with the help of participants involved in some form of recycling including; Orange County Environmental Protection Division (EPD), The City of Orlando, Waste Management Recycle America, Republic Services, Advanced Disposal, Waste Pro, Goodwill, American Textile Recycling Service (ATRS), and Recall shredding. The event will be held Saturday, November 15, 2014 from 10 a.m. – 2 p.m. at the Orange County Landfill located at 12100 Young Pine Road Orlando, FL 32829.